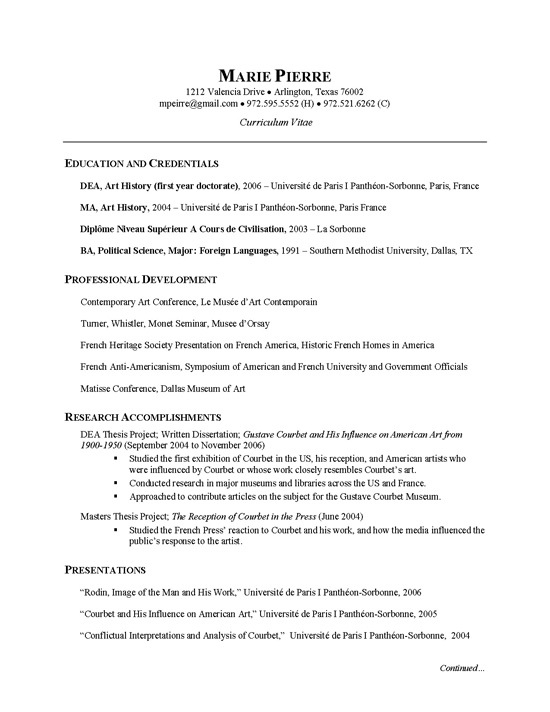 CV Example for academic professional, a research intern with international education in Art History. This is a good reference for a Researcher or Art Major. The CV lists professional development, education and credentials to being the document. The overall areas of strength include historical art, contemporary art, art exhibition and art museum management. Additional skills include art research, cataloging and teaching. You will notice that the research accomplishments and thesis work is highlighted above experience as it is more important than the internship work and teaching jobs. The job seeker’s education is listed at a DEA (first doctoral diploma) in Art History. This writer also includes professional affiliations, community service and scholastic memberships to document the level of activity and responsibility. The remainder of the Curriculum Vitae can be found in the PDF below. Directed art history research on famous artists utilizing major museums and libraries across the United States, Germany, France and England. Worked in Paris to instruct business professional on the English language to enhance presentations and correspondence. Utilized bilingual ability to create, prepare and implement language lesson plans for young children up to adults. Chosen for prestigious internship program at one of the top museums in the world. Taught French class at U.S. university and received letter of recommendation. Assisted with the process of evaluating, cataloging and indexing collections for the institution. Researched artist for exhibit-related educational program. Conducted several presentations son influential artists at the University of Paris. Researcher CV Example By Career Wizards Inc.